The GDR officially propagated equality between men and women, but the division of labor between the sexes continued to be informed by traditional patriarchal conceptions of gender roles. Granted, women had greater opportunities for education and careers, but they still remained unrepresented in leadership positions in all areas of society. It is telling, for example, that in 1964 only one woman could be found among the 20 candidates and members of the Politburo of the Central Committee of the SED [Socialist Unity Party], the most powerful body in the GDR. 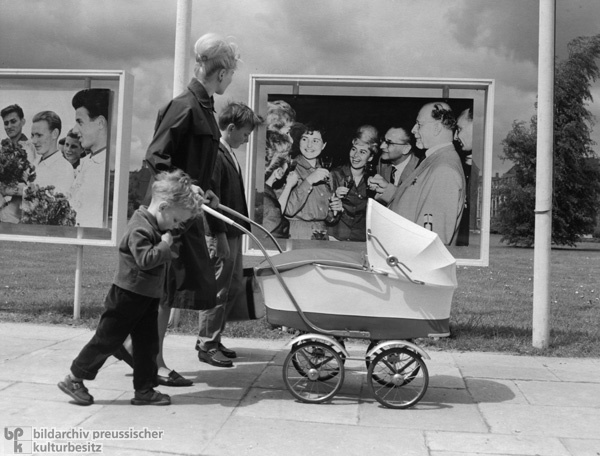 In this photograph, an East Berlin mother and her children pass by a Walter Ulbricht poster. Photo by Edelgard Rehboldt.